Credit: Christopher Andrews/Flickr. Some rights reserved. Few debates highlight the moral issues around how wealth is shared across society more than the growing demand for a universal and unconditional basic income. At face value, the idea of receiving a regular income from the state presents a fair and inclusive solution to the financial constraints many people face in a consumerist society—especially at a time when unemployment and inequality are on the rise. But it’s not clear whether a guaranteed citizen’s income would ultimately help or hinder the creation of truly sharing societies, in which ‘freedom from want’ can be achieved within a redistributive economic framework that reinforces the social ties that bind people and communities together. 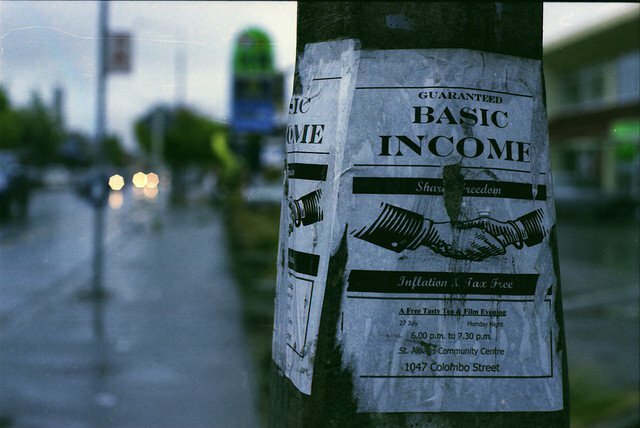 The arguments in favor of a basic income are persuasive and should not be dismissed lightly. Aside from the clear case for reforming means-tested benefit systems that are failing many targeted claimants, there’s the question of how to maintain decent wage levels when jobs become increasingly scarce. In 1930, John Maynard Keynes famously posited that standards of living would be between four and eight times higher in a hundred years’ time, and that people would need to work a mere 15 hours a weeks. Although Keynes’ era of leisure is still a pipedream for most people despite the tremendous improvements in living standards he predicted, it’s likely that formal working hours will have to be significantly reduced in the years ahead. For the past three decades the demand for labor, and wages as a share of GDP, have both been declining. Meanwhile, people are living longer and retiring later, and part-time work, insecure casual contracts, and self-employment are increasingly the norm for the precariously underemployed. The reductions in wages that could follow this dramatic shift in employment patterns provide a pragmatic case for the state to grant a supplementary unearned income to all citizens in order to prevent millions more people falling below the poverty line. A basic income could give people the freedom to work fewer hours if they choose. Sharing the work available more equitably across society would also have a range of additional benefits such as reducing levels of consumption and markedly improving the quality of life. Despite these convincing arguments, there are plenty of reasons for being cautious about the basic income, particularly since it is most often proposed as an alternative to existing systems of social protection. From an ideological perspective, there are important differences between the provision of a universal basic income and the insurance-based benefits it would replace. Welfare states essentially promote social solidarity through a process of economic sharing, since they provide collectively-funded services that ensure everyone has access to social protection without having to rely on commercial alternatives. Rather than sharing risks and pooling resources in this way, unconditional cash transfers provide people with the money they need to fend for themselves, which is a highly individualistic approach to achieving social security. This is a key distinction for progressives to bear in mind, since a citizen’s income would be competing for the same government funds that currently pay for a wide range of social services. Under the present trajectory of public policy—in which welfare services are being subjected to increasing waves of neoliberal reform—it is therefore likely that basic income schemes would undermine existing mechanisms of redistribution and social solidarity. It’s also clear that the cash transfers most universal programs would deliver in industrialized countries would be too low by themselves to keep households above national poverty lines. A truly comprehensive program for a citizen’s income is likely to remain unaffordable unless it is accompanied by a substantial shift in the way governments raise taxes, while a less costly version may not provide a worthwhile alternative to means testing. In light of these problems, it is worth considering an alternative approach that sidesteps many of the arguments against the idea of a basic income: a universal social dividend that’s based on the value of shared resources.